No photographic evidence but it happened just the same. 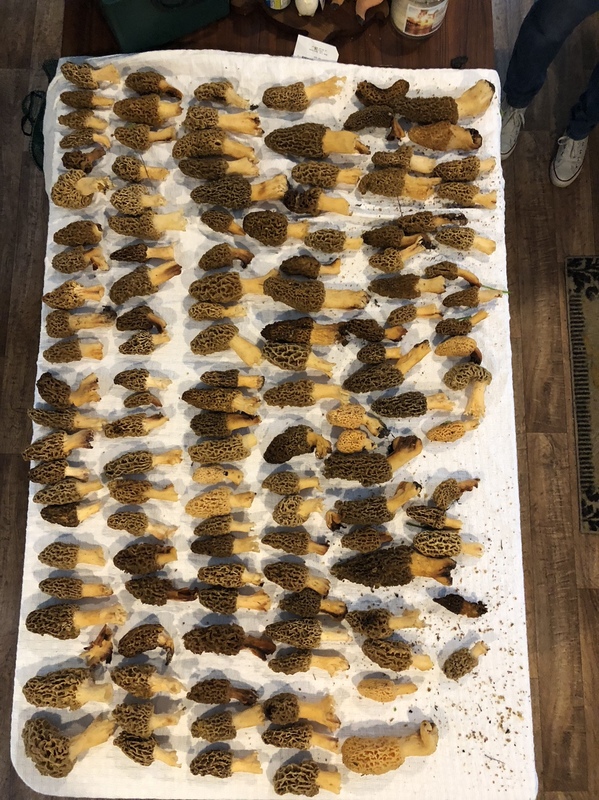 My wife and I went to Charlotte yesterday to have lunch with our daughter, headed up the walk from the drive to the front door and right there, growing out of her mulch bed were about 20 morels within 20 feet of the door. Some were fairly small but with the proliferation of deer in her neighborhood we figured that if we didn't get them right away they wouldn't make it through the night. Does anyone on the forum hunt them on a regular basis? The only mushroom that I care for. I don't get to look for them much though. My wife's uncle sends me some occasionally when he gets a lot. I'm a novice forager (I forage violets, wild lettuces, acorns, wood sorrel, and other good beginner stuff) and morels are on my list as the only mushroom I'll be looking for. I think I may have to take a trip to the foothills or the mountains sometime this spring to look for them though, as the Sandhills are not a place they would like to grow. Yep, I have a Peterson field guide that says to be careful about false morels and describes how they are different from the true morels. It says to avoid the ones you see in summer and fall since most of those are false, vs. in the spring. But thank you! I'm in Wake county, their here, there and almost everywhere. Not here. LOL. Save me some spores. He asked about morels, not those Hickory Chickens haha. Ah, I've always thought of you as amorel. When did they start appearing in the mountains? Around May? Where at in wv and md mountains? I’m originally from up that way, and I remember picking lots of mushrooms. Since there are no pictures of the Charlotte mushrooms, it did not happen. And since I have the misfortune of living in CharMeck I will only believe it when I see pics with the street address in plain view, so I can go over there and investigate said tasty mushrooms. Just kidding! Surprised me to find them, especially there. Told my SIL to take a bucket full of the old hardwood mulch where they were growing and seed some rotten logs and limbs in the gully behind their house on the shady side. Maybe he can get some more started in another year. They have so many deer around their house that they probably wouldn't last long if successful. They've counted as many as 19 at one time, sometimes 3-4 bucks at a time, one an awesome perfect 10 point which looks fairly young. I have smart phone video of him but don't know how to get it on the forum. They live in Meadowbrook but that's all you get. I’m from up around Savage River SF. Hunted, fished and stomped that ground most of my life. Did some fly fishing around Thurmont. Catoctin Creek & Hunting Creeks. Used to find sacks upon sacks of mushrooms around Bloomery, WV west of Winchester, VA.
You should not have told me that...Meadowbrook in the Wilgrove community? Just poking @ ya!